To ensure everyone has a fair shot, we will be running a mini "shark week". Initial registrations will be taken by email between Thursday 4 December and midnight Monday 8 December, after which games will be allocated. Where a game is oversubscribed, the decision will be random. In rounds where there are multiple options, I am happy to take a first and second preference. There is another game likely for round 7, and I'll open registrations for that when I receive a blurb. Note that there are a host of fantastic tabletops as well, so don't worry about "missing out". There will be something good to play regardless. This year's KapCon flagship is Crisis Point, a superhero larp covering everything from spandex-wearing caped crusaders to modern gritty and grim antiheroes. You can register for it here. Please remember that you will need to register for the convention as well. KapCon 2015 is officially calling for games. Its 4.5 months until the con, and we've got the first few games up. But as always, we need more. In particular, we need to have at least 8 tabletop games to offer for round one when we open for registrations in October. We don't care what you run. Our attendees have a huge range of tastes, and you can find players for almost anything. Provided it runs in a three hour session and you tell people what they're in for, we're good. If you'd like to help us with this, then fill out the form. We're also calling for small larps. We aim to provide ~24 larp spaces per round this year, so we're after small games in the 8 - 20 player range. Note that you will have to do any set dressing yourself, and that the time available for this is limited, so you may wish to keep it to a minimum. note also that as changing facilities are limited, costume-light games are easier for the players. We will pre-register players if your game is costumed, to allow you to cast in advance. If you'd like to run a larp, its the same form, which you can fill out here. If you want to do anything unusual, please check our game legend for guidelines. Welcome back. Kapcon 23 is over and we are now working towards Kapcon 24 in 2015. It saw the introduction of Adventure Squad, which caters for Kapcon’s younger players. We see the need for this growing in the future as many of our attendees register for that most gruelling and rewarding game of parenthood. Kapcon’s Code of Conduct was formalised to allow for the organisers to act swiftly and with certainty on poor conduct and misbehaviour. Overall, attendance continues to gradually decline, though this seems to be in line with the hobby throughout Wellington, due to the explosion of so many great other RPG events around the country. The Kapcon organisation committee for 2015 is: Ellen Boucher and Sam Walker as lead organisers; Daniel Atkins, Norman Cates, Nick Cole, Malcolm Harbrow, Scott Kelly, and Russ Kale in support. If you wish to contact the organisers for any reason, please send an email to: kapcon@gmail.com. The organisers are to improve their communication with their attendees, starting with this annual statement. You can expect to see the same again at the start of each year. All Con related information throughout the year will be consolidated and posted on this site, with links to it on NZRaG and Facebook. Kapcon will also look to reduce its non-Con related notices. Kapcon feedback is to be sent to Kapcon’s email address. Once received, it will be acknowledged and forwarded to the organisers for discussion. We don’t promise that every feedback will receive a substantive response, but if it is sent by email it will be heard and considered. Kapcon organisers will also be responding to feedback posted elsewhere, such as on Facebook or NZRaG discussions, with a suggestion that it be sent via email. The practice of sending flyers throughout Wellington and around the country will be re-introduced. Kapcon will continue to encourage GMs to run a wide variety of games. We will also be soliciting attendees’ game and genre interests later this year, as well as through registration. If you are not sure what to run, then consider contacting Kapcon by email for ideas. You can also expect to see us post up a list of SDC entries that seem especially suited to be picked up and run by GMs who may not have a game of their own design ready to run. Thanks to all who attended Kapcon 23. We hope to see you all and others at Kapcon 24. 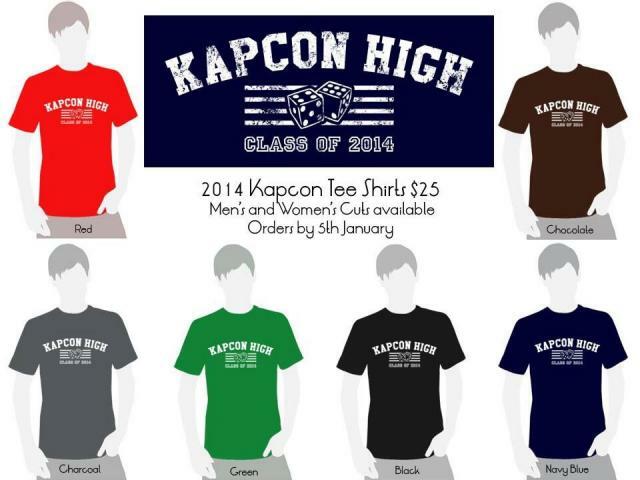 Here's the design for this years Kapcon t-shirt. Price will be $25, available in 6 colours and both men's and women's cuts. Last day for orders will be 5th of January.